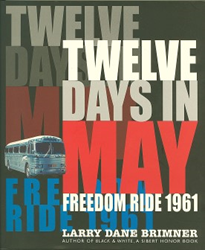 Acclaimed Children’s Author Brings Civil Rights Era to Life in New Book, "Twelve Days in May: Freedom Ride 1961"
Larry Dane Brimner tells a powerful true story that especially resonates in today's climate. To celebrate the seventh anniversary of the U.S. Supreme Court’s desegregation decision of Brown v. Board of Education, a diverse group of 13 riders boarded two buses on May 4, 1961, in Washington, D.C., heading for New Orleans. U.S. law allows anyone to sit in the front of the bus, but in the South, only whites are allowed this privilege. When the buses hit Alabama on May 14, Mother’s Day, all hell breaks loose when the black and white riders challenge local customs. Among Brimner’s other Civil Rights books written for middle school readers: "Birmingham Sunday" was a Jane Addams Children’s Honor Book, an NCTE Orbis Pictus Honor Book, and a Kirkus Reviews Best Children’s Book of the Year. "We are One" was a Jane Addams Children’s Book Award Winner. About the Author: Larry Dane Brimner, whose books have been awarded the Robert F. Sibert Honor, the Orbis Pictus Honor, and the Carter G. Woodson Award, among others, is the author of 200 fiction and nonfiction books for young readers. With a special interest in civil rights and social justice, he often focuses on these issues in his nonfiction work, but he also writes about sports, natural science, and other diverse topics. A former high school teacher and college instructor, this Florida native now lives in Tucson, Arizona. Also look for the author’s other new book "Puppy & Bear: The First Day of School." https://www.boydsmillspress.com/bmp/books/non-fiction/twelve-days-may or at Amazon.com or Barnesandnoble.com.